Leonardo Co was born in Manila on December 29, 1953; the eldest child and only son of Lian Sing Co, a Chinese immigrant, and Emelina Legaspi of Taguddin, Ilocos. He grew up in Caloocan and studied at the University of the Philippines during Martial Law. He was a true scientist for the people, using his scientific and technical knowledge and skills to serve the Filipino people, resist Marcos dictatorship, and struggle for an independent, genuinely democratic and just society. 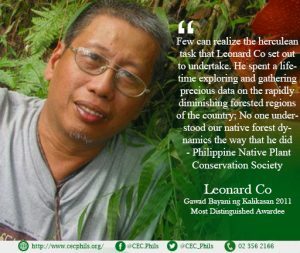 Leonardo Co was the most distinguished awardee of Gawad Bayani ng Kalikasan 2011. Co was felled at a time when his life’s work was beginning to see fruition. On the morning of November 15, 2010, Co assembled four-man team for a reforestation project in the Manawan- Kananga Watershed in Leyte. By that afternoon, Co and two of his companions were dead, killed by a hail of bullets from the 19th Infantry Battalion (IB) of the Philippine Army. For 8 years, Co’s justice has not been served. Co’s family still continues the fight for Justice for Leonard even after in January 2011, the Department of Justice (DOJ) and National Bureau of Investigation (NBI) own fact-finding team released its report, which cleared the 19th IB in the killing. The report contradicts the report from an independent fact-finding mission that concludes that there was no encounter with New People’s Army as the military unit wrote off. With this, the family continuously urges DOJ to release the resolution that the case of Leonardo is a murder case and not just a reckless imprudence of the armed forces.